Pickled garlic is a unique way to add some flavor to everyday meals. Garlic pickles are great accompaniments to pastas, salads, and sandwiches. Pickling helps the sharp taste of garlic to mellow out. It creates that burst of softer pungency that is characteristically pickled garlic. Also, this type of pickle has a long-lasting shelf life and is rich in anti-oxidants. Pickled garlic is typically stored in jars and stored in a dry and dark place. If canned properly it needs no monitoring and can hold on for about a year. Fresh garlic can be stored, but over time, it rots. Many people pickle garlic to give this root bulb a longer shelf life. Garlic comes in several forms, including black garlic, and any of them can be pickled. Pickled garlic has its own distinctive flavor from its fresh counterpart. Pickling alters the garlic's natural flavors but also enhances them. There is also the consideration of the health benefits of pickling. Garlic has anti-bacterial and anti-fungal properties. Pickling it does not strip away those benefits. Other ingredients that are considered to be good pickled garlic companions are hot peppers. Together, they create a spicy and tangy flavor. Pickling garlic uses a similar process as pickling cucumbers. Prepare the garlic by removing the skin and trimming off the root. Throw away any damaged or discolored beans. Rinse them thoroughly in cold water to remove dirt and sand then drain in a colander. Prepare any additional ingredients you will be adding such as onion, peppers, or herbs. Add all the ingredients into jars. Remove the pickling solution from the heat and pour it into the jars filled with garlic. Leave about 1/2" at the top of the jar. Seal the jars. If you are canning the garlic you now process the jars in a water bath for 15 to 30 minutes, depending on the size of the jars. Once the jars are processed they can be stored in the cabinet for up to a year. 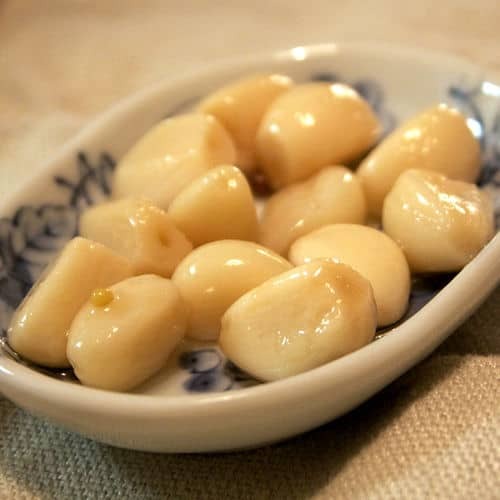 The pickled garlic will typically be ready to eat after a day but the longer they remain in the liquid the more flavorful they will become.